The Chiefs knocked the Crusaders off the top spot in the Super Rugby standings with a 23-13 victory in the historic first ever Super Rugby match to be held in Fiji. Super Rugby Round 15 is being played across six countries and this match at the National stadium in Suva is the first time Super Rugby has been played in Fiji. The result extends the Chiefs run against the Crusaders to four straight wins and 2016 is the second year running that the Chiefs have done the double on the Crusaders. The Chiefs won four out of seventeen matches against the Crusaders between 1996 and 2011 but since 2012 the Chiefs have won 9 out of 12 matches between the sides. The Crusaders dominated the opening ten minutes of the contest but by half time they had been outscored two tries to one in the match and trailed 17-10. 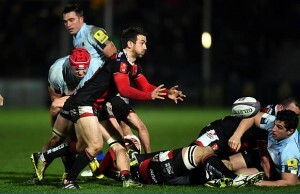 No further tries were scored in the second half and all of the points were from penalties. Crusaders Number 10 Richie Mo’unga kicked a late penalty which put his team in line for a losing bonus point but then a last minute Damien McKenzie penalty took the bonus point away from the the Christchurch. Had McKenzie missed the penalty the Crusaders would have come away with the bonus point and retained the top spot. Instead the Crusaders drop to fifth place overall even though they are one point behind the Chiefs. The Chiefs denying the Crusaders a losing bonus point could prove a key advantage in the battle to win the ultra-competitive New Zealand conference and gain a crucial home finals berth. Even though the Crusaders are the second-best performing team in the competition, they now drop to fifth behind the four conference leaders. The Suva showdown was billed as a home game for the Chiefs, who said it acknowledged the contribution Fijian players have made to New Zealand rugby. 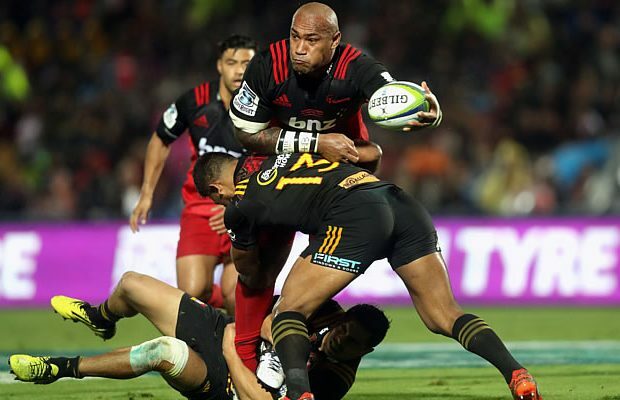 The Crusaders team included two Fijian wingers, Nemani Nadolo and Jone Macilai-Tori, while the Chiefs fielded Fiji-born All Blacks centre Seta Tamanivalu. The sell-out 20,000 crowd went wild every time one of their local heroes touched the ball. 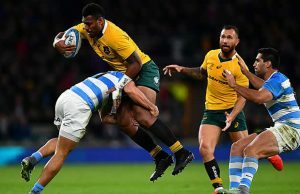 With the competition resuming after a month-long break for international fixtures, the Crusaders looked rusty despite throwing their returning All Blacks into the fray. They committed 10 handling errors and conceded 18 turnovers in rainy, humid conditions. A fired-up Nadolo helped them build some early pressure but they failed to break the Chiefs’ line and had to settle for a Richie Mo’unga penalty. The Chiefs countered through Tamanivalu, whose perfectly weighted kick put James Lowe into space for the opening try in the 21st minute. Brad Weber added another 10 minutes later after Damian McKenzie set him up with a scintillating run past four opposition defenders. Macilai-Tori closed the gap to 17-10 right on half time, capping after a slick attacking move that saw the ball go through 12 pairs of Crusaders’ hands. The match became bogged down in the second half as the heat took its toll, with only three penalties scored, including McKenzie’s calmly taken effort at the death. Next week in Round 16 the Chiefs travel to Brisbane where they will play the Reds while the Crusaders host Melbourne’s Rebels in Christchurch.